Christchurch: Women across New Zealand wore makeshift hijabs as a statement of peace and solidarity on Friday, a week after a white supremacist killed 50 Muslims at two mosques in the southern city of Christchurch. Rafaela Stoakes, a 32-year-old mother of two, said wearing the Islamic head covering gave her an insight into what it means to stand out and feel part of the minority. She was one of many women embracing #HeadScarfforHarmony, to make a stand against the hate espoused by the Australian man accused of killing dozens of worshippers. 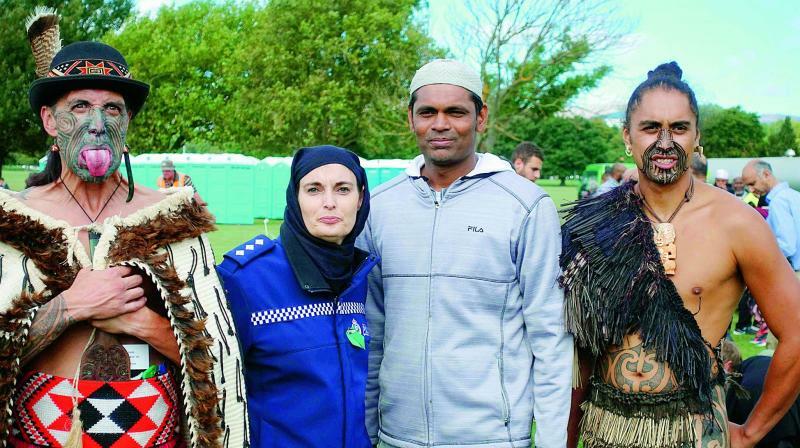 Headscarves were also worn as a mark of respect by policewomen and non-Muslim volunteers directing the crowds around the site in Christchurch holding communal prayers on Friday. Many were wearing a headscarf for the first time. “It is amazing how different I felt for the short time I was out this morning,” Stoakes said. “It must take a lot of courage to do this on a daily basis.” The gesture caught on nationwide — in offices, schools and on the streets — as well as at the ceremonies held in Christchurch to mark one week since the killings at the hands of a self-avowed white supremacist. Women flooded Twitter, Facebook and other social media — which played a key role in allowing the gunman to spread his message — with their images. Kate Mills Workman, a 19-year-old student from Wellington, posted a selfie on Twitter wearing a green headscarf. “If I could I would be attending the mosque and standing outside to show my support for my Muslim whanau but I’ve got lectures and I can’t really skip them,” she said, using a Maori language term for extended family.